Gingerly manoeuvring around the tight winding staircase behind the legislature chamber, three men carry a 100-pound, five-foot long piece of priceless Alberta art. 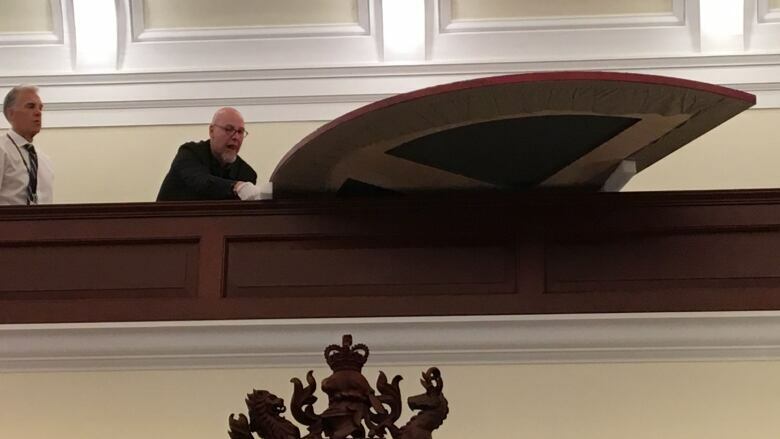 The piece is being moved to the upper gallery of the chamber, where it will be installed opposite a sister work on the other side of the grand room. They are priceless works of art because of who created them and why they were done. 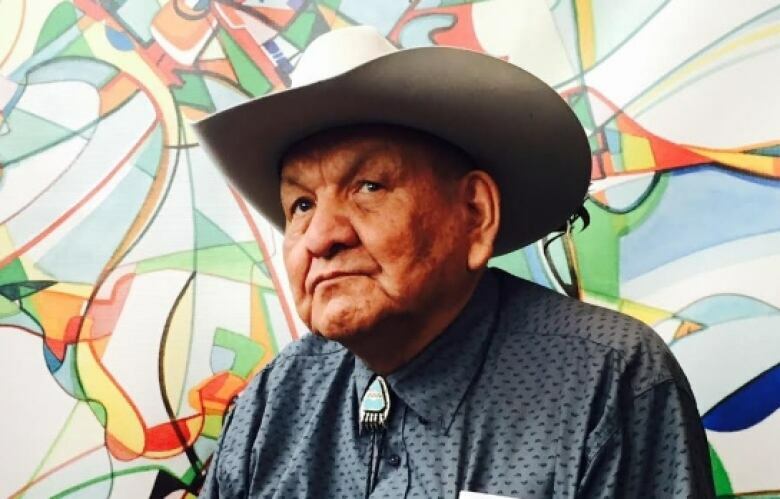 Sunrise and Sunset are two paintings by celebrated Alberta artist Alex Janvier. 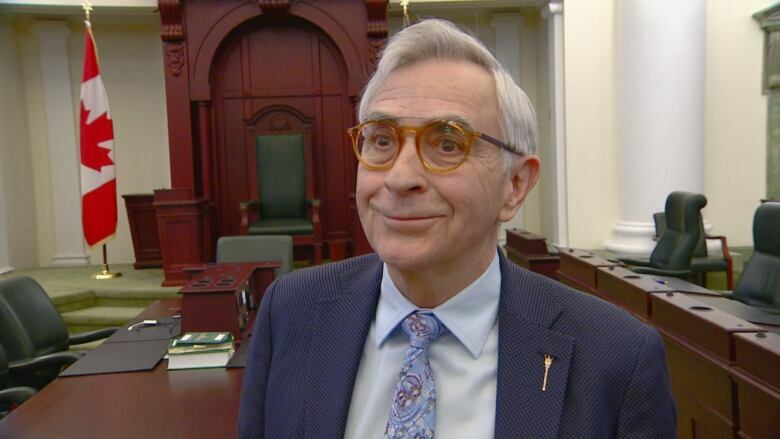 They were specially created to acknowledge reconciliation and the contributions to Alberta by Indigenous people, said Bob Wanner, NDP MLA for Medicine Hat, and Speaker of the Alberta Legislative Assembly. Wanner said the idea of procuring the pieces came to him in June 2015, when Premier Rachel Notley made an emotional apology for the provincial government of the day staying silent about the abuse of Indigenous children in residential schools. "I was moved by it," said Wanner, remembering what it was like as he looked up from his chair on the floor of the legislature and saw four chiefs in full headdress standing above in the visitors gallery. "I recognized as I looked down into this chamber that is the centre of Alberta's democracy, there was no acknowledgement of any kind to our First Nations and Métis people," said Wanner. After that, Wanner gently suggested to the Alberta Union of Public Employees (AUPE) that now might be the right time to make a significant and symbolic gesture to the legislative assembly. And maybe they could pay for it. After all, said Wanner, about 50 years ago, the Civil Service Association of Alberta — the forerunner to AUPE — paid for the assembly mace as a gift to Alberta. With the AUPE now in its centennial year, an iconic piece of art might be just the thing to emphasize ongoing reconciliation, and the value of the public service, Wanner reasoned. "And so we had some ongoing discussions with them (AUPE)," said Wanner, and "they were very interested and wanted to make a gift — a second gift to the legislature." AUPE paid for the two commissioned pieces, but is not disclosing how much it cost members. Union spokesperson Mariam Ibrahim said the total cost will not be released out of deference to the artist. Ibrahim said the decision to commission the art was authorized by the union's provincial executive, which agreed to cover the cost from AUPE's centennial celebrations budget. "As we reflect on our organization's past, we want to share this Indigenous art as a gift to the public and a celebration of our great province," she wrote in an emailed statement. Janvier is from the Le Goff Reserve near Cold Lake and is of Denesuline and Saulteaux descent. In 2016, he completed a massive mosaic for Rogers Place, Edmonton's downtown hockey arena. Janvier told CBC News he wants his art to reflect the all-consuming effort needed to run a government. "Their job is 24/7," he said from his gallery in Cold Lake. "I've made it from sunrise to sunset, but then from sunset to sunrise your machines take over and so they're constantly in the know." The pieces, which haven't been shown to the public, are stunningly beautiful. They capture the brilliance of Alberta's rising and setting days, while evoking images of playful spirits and free thinking. Janvier's creations will be revealed Monday, before legislators gather to hear the throne speech opening the spring sitting of the legislature.